Many patients are confused after having surgery, but delirium is a specific type of confusion that can take place in the hospital and during a recovery from surgery. While delirium causes confusion, all confusion isn’t caused by delirium. Delirium is a state of confusion that occurs abruptly. It is typically acute in nature--once diagnosed and treated, the patient returns to their normal level of thinking. A patient who is confused on a daily will be much more confused, and in most cases, will return to their normal level of confusion after the delirium has resolved. While anyone can develop delirium, certain groups are much more likely to develop delirium in the hospital. Age plays a role, but the severity of the current illness, the patient’s normal level of day to day function and the overall health of the patient play a part as well. As you can imagine, an elderly patient with dementia who requires intensive care is at significantly more risk than a young adult with no additional risk factors who is in a private room in the hospital. Intensive care units, in particular, are very disruptive to normal sleep/wake cycles, as the patients are experiencing frequent vital signs, frequent medications, are routinely being turned, are receiving more medications and are often in rooms that are brightly lit around the clock. In that setting, you may hear delirium referred to as "ICU Psychosis." It is most common in older adults and the elderly but can happen in any age group. It is also more common in individuals who have some type of mental problem in their day to day life, such as dementia. These elderly adults with dementia have the highest risk of experiencing a sudden decline in their mental capacity while in the hospital. Before a patient begins to show signs of delirium, there is an earlier phase that patients can experience for hours or even days prior. During this time frame, patients may report extremely vivid dreams, difficulty sleeping, a heightened state of fear or anxiety that wasn’t present before, and may start to request the constant presence of another in their room. Spotting these signs early can mean earlier intervention and potentially preventing the patient from experiencing full blown delirium in the coming days. There is no test for delirium, it cannot be diagnosed through lab work, it must be diagnosed by observing the behavior of the patient and determining if their behavior fits the diagnosis of delirium. Diagnosing delirium can be a challenge as it can be very different from patient to patient. In general, individuals with delirium may have difficulty concentrating on a single topic, generally seem disoriented and often have a reduced level of consciousness. Their disorientation and mental difficulties are often worse at night, a condition referred to as “sundowners” or “sundowning”. These individuals may experience delusions and hallucinations. Delusions are a false belief held by a person. For example, a patient with delirium may believe that the nurse is trying to assassinate them, or insects are infesting their bed. Hallucinations are a visual disturbance. A patient may see bats flying around the room and watch them fly from corner to corner. They may reach out and try to touch something that isn’t there or talk to someone who is not present or even an individual who has died. Physically, the patient often is unable to effectively sleep and may begin to have difficulty with swallowing, speaking in a way that is easily understood and makes sense, and may start to tremble for no apparent reason. These signs and symptoms have to be taken as a group, not individually. A person who suddenly has trouble swallowing probably doesn't have delirium, but a patient who cannot sit still, cannot swallow, is seeing birds in their hospital room and hasn't slept for days probably does. Delirium can present as an overactive type of delirium or an underactive type. Hyperactive delirium causes agitation, the patient may be wide awake potentially to the point of being unable to sleep for days, and may seem like they are on high alert. They may seem “wound up” or restless, as though they have had too much caffeine to sleep. This behavior is often odd in the context of their hospitalization--they are wide awake when one would be expected to want to rest as much as possible. Hypoactive delirium patients may seem lethargic, too tired to tolerate activity, depressed, sleepy, and may not be able to engage in conversation. This type is often more difficult to distinguish from being sick and tired than the more active type. Delirium is seen more frequently in surgery patients than the general population of the hospital for multiple reasons, they tend to be sicker than average, they receive anesthesia medications that can contribute to delirium, they may have a longer hospital stay and may receive pain medications during their recovery and other drugs that can worsen delirium. Aside from helping a patient obtain the quality sleep that they desperately need, patients with delirium will also need support taking care of the basic and essential needs that they cannot manage while ill. When a patient has delirium, it is important that the staff of the hospital (as well as family and friends who may visit) help to provide the patient with the essentials that they need most. These essentials include uninterrupted sleep, eating and drinking regularly, taking care of bathroom needs and routinely reorienting the confused patient. Frequent reorientation means simply gently letting the patient know that they are in the hospital, why they are there and what day and time it is. For family and friends, it is very important not to argue with a patient who is confused or experiencing delusions or hallucinations. You may gently attempt to reorient the patient to where they are and why, but arguing will only upset the patient and the family member. It is also important not to wake the patient when they are sleeping unless it is absolutely essential, and staff may choose to omit a vital sign check or a middle of the night medication that can wait until morning if it means allowing the patient to sleep. Some facilities provide earplugs and eye masks to patients in order to increase their quality of sleep by blocking out the constant light and noise. 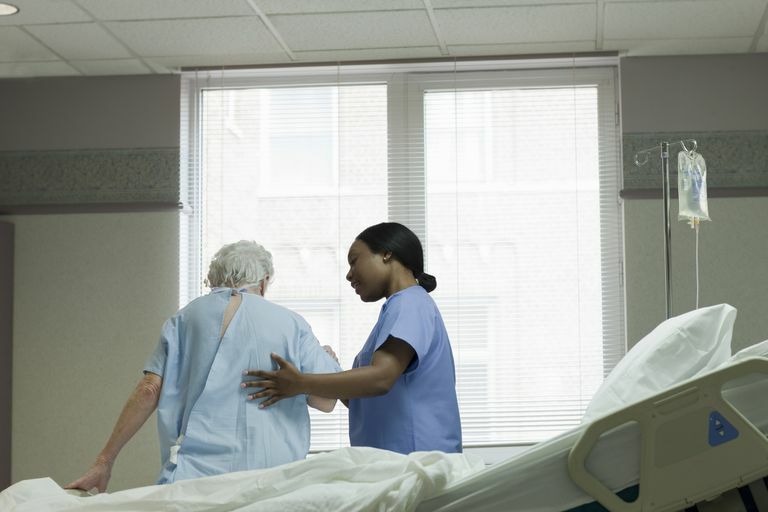 If the patient cannot be trusted to be alone without having an injury due to falling out of bed or other activities, family, friends, or hospital staff will likely need to be in the room at all times. Identifying the underlying cause of delirium is key to treatment. If a medication is causing the problem, stop it. If withdrawal from alcohol, illicit drugs or a medication is the problem, treat it. If severe sleep deprivation is the issue, treatment includes providing the best possible environment for sleep and medication to promote sleep. Prescription sleep aids, such as Ramelteon (Rozerem), are often given to make it easier to fall asleep, while other medications such as Ativan may be provided to decrease agitation and any withdrawal symptoms that may be present. Antipsychotic medications such as Haldol and Risperdal may be also be used, but need to be given in the lowest possible doses to prevent worsening of the patient’s confusion. Postoperative Delirium in the Elderly: Diagnosis and Management. Clinical Interventions in Aging. Thomas Robinson and Ben Eiseman.